There are many challenges and dangers you’ll encounter in the latest entry, Breath of the Wild, in The Legend of Zelda game series. It is also important to take a look at your heart from time to time. They naturally show your health. Link fills them when he takes food, which he must first cook. 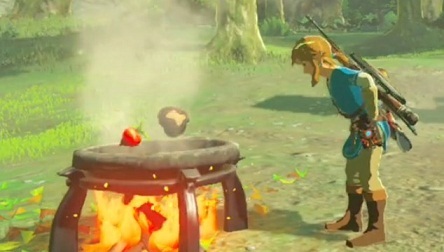 If you want to cook in TLOZ: Breath of the Wild, then you have to find ingredients. You will find them when you collect the corresponding plants or kill animals. At a fireplace you can then almost sack everything and cook the food. In fact, the cooking system is really complex and you have to get the first time. As the food for Link is now become more important. This is where great bonuses are hidden, which affect your attributes and abilities so that you can enter new areas. The recipes and the food enhance your stats, such as increased stamina, which allows you to climb longer or protect against cold. The latter means that you can now advance into cold regions. If you remember, in the past Zelda games certain tools have helped you get into other areas. - Collect everything you encounter for cooking, especially plants, mushrooms, fruits and meat from killed animals are suitable for you. - Via the inventory it is then possible to mix up to 5 ingredients at the same time. - Find a suitable fireplace and now put all the ingredients into the cooking pot. Now all 5 ingredients are mixed to a new, tasty food. - Sometimes you don’t need a cooking pot but the better recipes with the good bonuses always need a fireplace for cooking. - In fact, you even have the opportunity to set a fire on a meadow and put the meat there. Of course, the result is not as exciting as if you had prepared it on a proper cooking place. This is certainly fun. - If necessary, you can even eat some raw ingredients, but the result in hearts is weaker than after the cooking process. - Sometimes the cooking in The Legend of Zelda: Breath of the Wild can also go wrong, so that the dish is not edible at the end. That is why it is important that you look for a good and harmonious combination of the ingredients. For example: Meat and mushrooms are always fit together well. As in the real life, the spices cannot be missed. Especially effective recipes demand even better, special ingredients and also spices. For example Truffle is such an ingredient. It is not very effective, but in combination with other ingredients as a spice, it is top-notch and you will end up with valuable extra bonuses through the dish. For example, Truffles cause your life energy to be temporarily increased. This is indicated by an additional yellow heart. If you are faced with an important battle then it may be worthwhile to look for such spices, or to save them especially for such situations. Cool is also that you don’t only produce food, but also elixirs and potions. They are responsible for strengthening your attributes and abilities. It also increases your speed when Link consumes food. To learn how to cook in The Legend of Zelda: Breath of the Wild, you must try and practice a lot. Combine all possible ingredients with each other and see which result comes out at the end. Enduring Mushroom Skewer Raw Meat or Bird Meat + Endura Shroom 10 Temporarily increases stamina. Hearty Steamed Meat Raw Meat + Hearty Radish + Hearty Truffle 8 Adds three more hearts temporarily. Spicy Pepper Steak Meat + Hylian Shroom + Spicy Pepper 6 Ensure colder resistance for 5:30. Energizing Meat and Mushroom Skewer Raw Meat or Bird Meat + Stamella Shroom 5 Restores 1/3 of Endurance. Spicy Fruit and Mushroom Mix Spicy Pepper + Hylian Shroom 5 Ensure low colorfastness. Spicy Simmered Fruit Any fruit + Spicy Pepper 5 Ensure a colder resistance for 6:30. Spicy Peppers 5 Ensures a colder resistance for 10 minutes. Hasty Mushroom Skewer Raw meat or bird meat + Hyrule shroom 4 Temporarily increases the movement speed. Hasty Meat and Mushroom Skewer Raw Meat or Bird Meat + Rushroom 3 Temporarily increases the movement speed for 1:20. Sneaky Steamed Mushrooms Mushrooms 3 Ensure improved stealth ability for 3:30. Spicy Elixir Sizzlewing Butterfly + Bokoblin Fang 3 Increases resistance to cold. Energizing Salt-Grilled Fish Rock Salt + Fish 2 Restore part of the stamina. Energizing Fish Skewer Raw meat + Hyrule mushroom + Endura Shroom ¼ Heart Restore the entire Stamina.